On 21st Februray'2018, government told Supreme Court, how it has met the deadline of making BS-VI fuel available in the country, two years prior. Cleaner Euro-VI petrol and diesel would be dispensed at all retail outlets in the National Capital from April 1. After covering NCR, the government intends to make BS-VI grade fuel in the rest of the country. The government decided to switch over to BS-VI grade fuel directly from BS-IV skipping BS-V, as in India, number of registered vehicles in the national capital crossed the 1-crore mark in May last year, raising the further concerns over pollution levels and poor traffic conditions in the city. Data put out by Delhi government’s transport department put the number of registered vehicles in the city at 1,05,67,712 till May 25, 2017, including 31,72,842 cars. The biggest chunk of registered vehicles in the city is motorcycles and scooters (66, 48,730 units), which are known as major polluters due to poor emission standards. With BS-VI emission standards coming in and being implemented for all segments, the particulate matter in the norm will reduce by 82% and nitrogen oxide (NOx) by 68%; PM and NOx emissions from two-wheelers will reduce by 89% and 76%, respectively; and PM and NOx emissions from trucks and buses will drop by 50% and 89%, respectively. Further according to Centre for Science and Environment (CSE), BS-VI fuel would bring down sulphur content by five times from the current BS-IV levels i.e. 80% reduction will be witnessed. Also, the moment current fleet will upgrade to better fuel quality, the difference would be felt. But the maximum benefit will only be felt when the automobile technology is advanced to support BS-VI fuel. 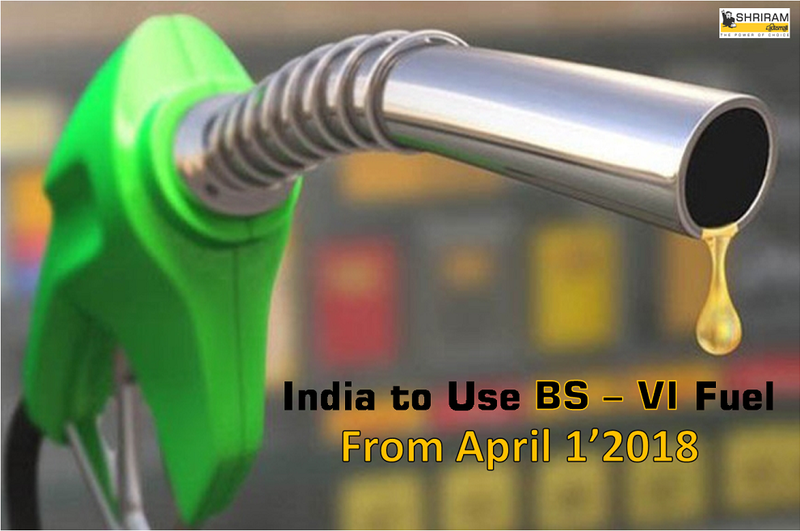 Till vehicles technologically advanced to support BS-VI, become available in the market, you can acquire used vehicle of any make and model compliant with BS-IV, supporting BS-VI fuel from Shriram Automall India Limited (SAMIL). So, what are you waiting for? Visit the Automall near to you today and acquire your desired used vehicle compliant with BS-IV emission norms at optimal prices. You can also click the link below to register yourself and download company’s mobile app.